Live, Love, Laugh and RENOVATE! : Look What Dad Made! This is the second edition of LOOK WHAT DAD MADE!!! My dad made this coffee table a month or more ago but my brother wanted to stain it with the help of my dad so it wasn't finished until last night. My older brother and my sister in law had as a coffee table 2 Ikea Lack tables in peacock blue. They loved the bright blue colour of the table BUT alas Ikea tables aren't made to last. 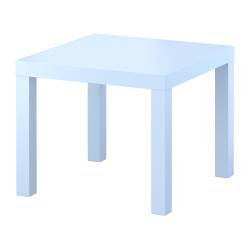 Their tables are similar to this picture before BUT in bright blue... apparently Ikea doesn't sell them anymore in bright blue because I can't find it on the website right now. They wanted something similar to what they had (but instead of having 2 small tables together, just have one big table) but they wanted it made of real wood (not Ikea particle board). In came super dad to the rescue. Now this project was a little tricky for him because he had to find a way to make the table sturdy and not wobbly. But he figured it out. So there you have it, a wonderful bright blue coffee table!!! Isn't my dad great!!! Stay tuned for more 'Look What Dad Made'. We are going to tackle shelves for the nursery tree soon!!! I believe he has also been commissioned to build a porch swing for my younger brother and sister in law! Fabulous Weekend and Fabulous Finds!